The email that you used to create your Mish account. Please contact your Mish Account Manager or a Customer Success Guru if you need to change this. The Snapchat account tied to your Mish Guru account. Please contact your Mish Account Manager or Sales Rep if you would like to create another account. This is the same as the password that you use to login to your Snapchat account (not the password you use to login to Mish Guru). If you ever change your Snapchat password, you will need to update it here so that we can continue to connect to your account. 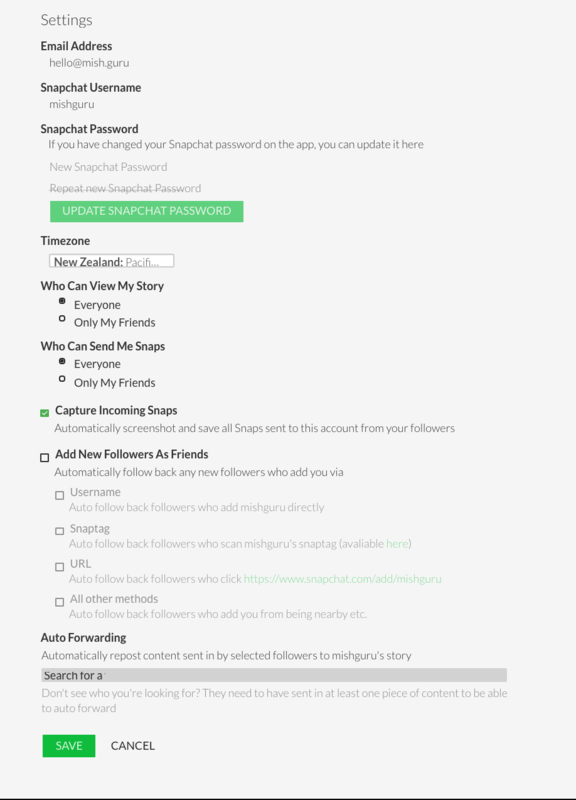 To update, simply enter your new password in the New Snapchat Password and Repeat New Snapchat Password sections, and click UPDATE SNAPCHAT PASSWORD to save. You will select your local time zone when you create your account, but you can update it here if you ever need. The time zone that you have set is the time zone that will be used for scheduling and as the time stamp for all received and posted Snaps. Choose between Everyone and Only My Friends, depending on whom you would like to be able to view your story. We recommend setting this to Everyone so that you have the widest possible audience and can attract new followers. Choose between Everyone and Only My Friends, depending on whom you would like to be able to send Snaps to your account. We recommend setting this to Everyone so that anyone who wants to will be able to respond to any CTAs or competitions, and you will have access to the most UGC. This setting is for capturing and saving Snaps sent directly to the account. Please note that because we are saving all incoming Snaps, the sender will be automatically sent a screenshot notification. We recommend enabling this setting so that you will have access to the most UGC. This setting allows you to automatically follow all accounts that begin to follow you. You can select to follow back anyone and everyone, or only accounts that come to follow your account by a specific method (username, Snaptag, URL, all other methods). We recommend keeping this setting disabled, as it can make your account rather cluttered when you go to view your friends' stories. Here you can add and remove accounts with permission to automatically post to your account (Autoforwarding). Check out this handy article to learn more about autoforwarding. And those are your settings! Don't forget to click SAVE before navigating from the page if you've made any updates. Now go ahead and start using your perfectly set up account!